I can’t believe this little blog of mine is celebrating it’s 2nd birthday! 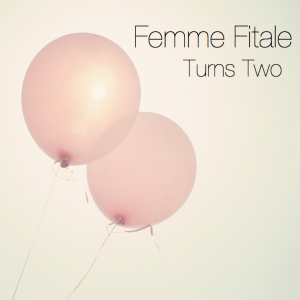 I started writing Femme Fitale on April 6th, 2012. Blogging had been on my mind for quite some time. I’d just come home from a vacation to Roatan, Honduras, and Adam had stayed behind for a second week with his brothers to do some diving. I had to return to Calgary, as teachers only have the luxury of a 1-week spring break! I had been feeling a bit bored, so thought it was a great time to finally take the plunge into the blogging world. Little did I know that two years, a move across the globe, and a baby later, I’d still be here typing away into cyberspace. Blogging has been quite the journey. I’ve met and connected with some amazing “blends” (blogger friends! ), have had wonderful opportunities working with a few brands that I support, attended blogging and media-related events, and received so many emails/questions/comments from people from all over the world. I never realized the places I could go with my blog, and it’s certainly been an exciting ride. On a personal level, blogging has allowed me to maintain creativity and have a focal point or hobby outside of the otherwise all-consuming role of “stay at home mother”. Living so far from home, it has also been the bridge and connection to my family and friends; the ones who have supported me since Day 1. Actually, it was probably more like Day 60. I didn’t tell many people about my blog for the longest time. Anyone who knows me would probably agree that I’m not really your typical “open book” kind of gal. Although I am straightforward and honest, that doesn’t mean I’m not private. So, blogging was extremely daunting in the beginning. And to be truthful, it still is sometimes. Ever since I was young, I’ve always worried about people judging me. I realize that I shouldn’t get too worked up about what other people think, but the truth is, I do. Blogging is challenging. It is for me, at least. Lately I’ve really been doubting myself and questioning my purpose in all of this. Sometimes I feel like I just don’t have the time and energy to put any more into this blog than I already do. I get anxious when I see bloggers posting 6 times a week, when I can barely hit ‘publish’ once. In all honesty, I can’t commit my hours/days/weeks/life to blogging. I wish I could treat it like a job…but it’s not one. So, I can’t. Instead, I choose to spend my days with my son. We play in the living room and make huge messes. We go for walks every day. We play in the park. I cook or prepare him 3 meals and 2 snacks each day. We read stories. We get together with friends. We go to baby gymnastics and swimming. We go to the gym so I can work out. He plays by himself while I try to clean up the kitchen, do laundry, or make the bed. He naps and I finally shower, eat something, respond to some emails, try to blog. This is my life, and precisely why I can’t make blogging a main priority, even though I would love for it to be one. I am starting to accept this fact. At times I feel like a rational parent, trying to let the blog just “be”, rather than push it to be bigger and better, or expecting more than it’s already providing. Femme Fitale, once a project, is now a piece of me. Although I’m not sure how much it gives to others, I know that I have gained an enormous amount from my experience in writing it. And when it comes down to it, isn’t that the purpose of blogging in the first place? Who knows what this next year has in store. All I know is that I am extremely grateful to all of you for your support, thoughtful comments, continuous encouragement, and for genuinely caring enough to check in on what I have to ramble about on any given day. I seriously couldn’t do this without you guys, so thank you.